Before Saturday night’s game, the Brewers collapsed by giving up a 6-0 lead to the Cardinals, effectively eliminating them from the playoffs and guaranteeing the Rockies their first playoff spot since 2009. Colorado will head out to Arizona for a duel in the desert against the Dbacks for an inter-division playoff game that will then begin an inter-division playoff series against the Dodgers. The Cardinals eliminating the Brewers, instead of the Rockies winning and eliminating them, took a way a little of the luster of clinching, but when you make the playoffs for the first time in eight years, who cares how you do it. 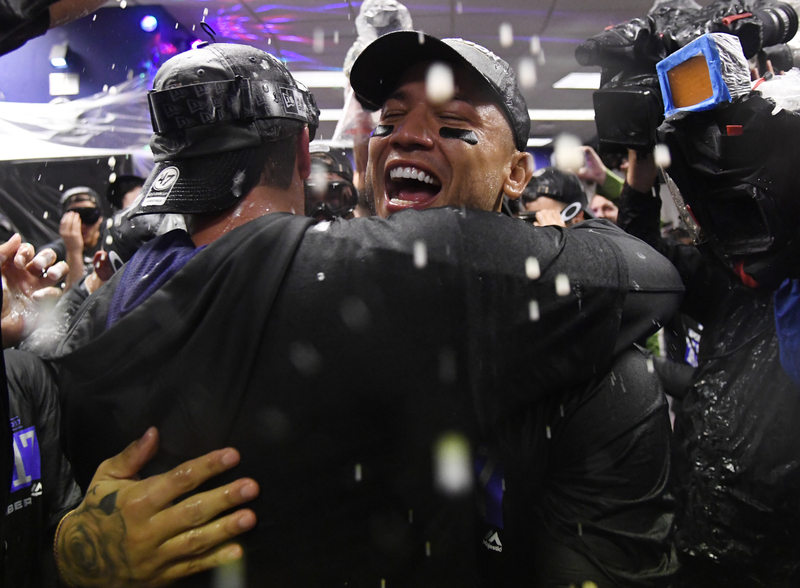 With the whole club watching the game and seeing it come to an end, the clubhouse erupted into congratulations and the Rockies took to the field to a home crowd that was more than excited to see the Rockies back in the playoffs. Obviously the real celebration would not begin until after the game, but once it ended the Rockies celebrated like any team should. For most of these guys, this is the first time they will taste the playoffs. Star players like Charlie Blackmon and Nolan Arenado will be making their first visit. Young guys like Jon Gray, Trevor Story, and Raimel Tapia are also making a first time appearance, albeit much earlier in their careers. But the Rockies do have some returning playoff players. Carlos Gonzalez is the only Rockies who remains from the 2009 appearance and will hope to do damage to carry the Rockies to a successful playoff run. Ian Desmond, Mark Reynolds, Gerardo Parra, and Jonathan Lucroy all make a return to the postseason, this time with a club that is a young contender. Having the playoff experience of these guys will be huge as they know the atmosphere, but first and foremost, the Rockies need to win the wild card game. Zack Greinke will face off against Jon Gray for a huge series for both of these clubs. Many of the Rockies have had success, with Cargo, Story, LeMahieu, and Lucroy all batting over .300 against him. Similarly, the Dbacks have players with success against Jon Gray, though the successes and struggles are more spread out. Some players are hitting over .400, Pollock, Peralta, Owings, while others are doing terrible against Gray. Paul Goldschmidt is hitless against Gray in eleven at bats, for example. Regardless, this is a game for the ages, at least as far as the new age of Rockies goes.